From the moment Rolando Herrera first set foot in Napa Valley, when he was eight, he felt at home. His father first brought his family to Northern California in 1975, only to return to Mexico five years later. His dream, however, stayed in Napa. In 1982, when he was 15, Herrera declared he would be going back and enrolled at the local high school, taking part-time work as a dishwasher at Auberge du Soleil and Mustards Grill, where he eventually became a cook. He wouldn’t stay in the restaurant industry for long, though. In 1985, as a high school senior, he found another job breaking down rocks for houses overlooking vineyards. One of the homeowners happened to be Warren Winiarski, the founder of Stag’s Leap Wine Cellars and the celebrated winemaker responsible for the 1973 Cabernet Sauvignon that upended the wine world by beating out French Bordeaux in the 1976 Judgment of Paris blind tasting. Though Herrera knew nothing about Winiarski, Winiarski quickly took notice of Herrera, impressed by his work ethic, offering the teenager a job on his next grape harvest. Winiarski’s impressions were right and Herrera proved to be a natural and that first harvest planted the seeds of what would become a lifelong obsession. After high school, Herrera enrolled at Napa Valley College where he took every available course in viticulture and enology. While getting his degree, he continued working for Winiarski, and after three years, he was promoted to cellar master, a profound realization of his deepest aspiration. But Herrera’s dream was just beginning. Herrera stayed at Stag’s vineyard for 10 years where he rose from grape crusher to cellar rat—a title and position he loves—to cellar master. In 1995, he took a position at Chateau Potelle as assistant winemaker and production manager. And that was where he really learned to become a winemaker, involved in the vineyard, the cellar, the lab, and the blending. It was a challenge, but one he embraced. After promotions to winemaker at Vine Cliff Winery and director of winemaking at Paul Hobbs, he was eager for more. Looking back on the profound pride and respect with which his grandparents tended to their six-acre farm, Herrera was ready for his own land. So he struck out to follow his dream and founded Mi Sueño. Founded in 1997 with 200 cases of Chardonnay, Mi Sueño now produces eight to 10,000 every year. It is 100% estate—they are farmers, growers, and winemakers, doing everything from crush to bottle. For Herrera, the American Dream was always within reach. Even as a young boy in rural Mexico, he fondly remembered bike rides along the grape pomace and promised himself that one day he would return. Despite the obstacles—a high schooler making his own way, working two jobs, far from his family—he was willing to make the sacrifices necessary. And that attitude saw him reach his dream—a manifestation of the American Dream he has long held close to his heart. “Mi Sueño’s an American dream come true by taking advantage of all the opportunities that come our way,” Herrera says. “I didn’t ever have the opportunity to decide or choose what vineyard I wanted to buy. I wish I did, but I didn’t. My philosophy is I like to turn over every rock in my path, because you never know what’s underneath that rock, and if you like what you see then you capitalize on that.” And capitalize he did. But that was then. These days, talk about walls and sanctuary cities often crowds out mentions of opportunity and equality. When James Adams coined the term in 1931, he declared that the American Dream was a dream in which “life should be better and richer and fuller for everyone, with opportunity for each according to ability or achievement.” He made clear that the American Dream should and would not be limited by social class or circumstances of birth. Does Herrera believe that recent political climate has signaled an end of the American Dream? In 2003, Herrera and his wife, Lorena, birthed an eponymous reserve label in their home of Napa Valley. Single-vineyard and single-variety, the Herrera wines are named after their six children. As his grandparents taught him, every harvest is a “gift from Mother Nature,” one that should be tended to with deliberation, and celebrated for its nuances. Each Herrera wine is reaped from a specific vineyard—and specific rows on said vineyard—aged in specific French oak barrels, with specific fermentation regimens. It’s a labor of love. To make single-vineyard, single-variety wines at a consistently high level is a tall task. But it’s a distinct honor for the proud parents, and for Herrera, whose lifelong pursuit of this dream began in El Llano in the Michoacán state of Mexico, it is the pinnacle of his career, one rooted in family. 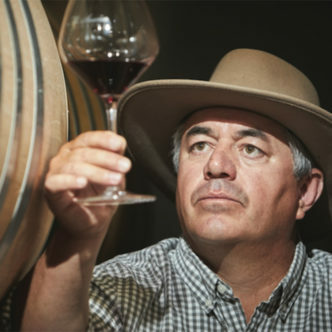 As a young boy in Michoacán, Herrera developed an understanding and appreciation for the terroir that would travel with him to Northern California. Herrera’s grandparents would tend to their six-acre farm with profound pride and respect—and those values stuck with him. They are lessons rooted in the experiences of his forefathers. These days, Herrera takes it upon himself to encourage the American Dream in his crew, hoping that they, too, realize their deepest aspirations. way, but so I could learn it and grow with it. My wines are a blend of Stag’s Leap, Chateau Potelle, and Paul Hobbs. I’ve taken all those great experiences into my own philosophy. “I’ve also brought in the history and experiences of my grandparents into it in the way of respecting Mother Nature, representing and understanding the land. As much as I love being in the cellar, crushing my grapes, tasting through my barrels and blending, my love is for the vineyards. In my mind, that wine is made in the vineyard—it starts there.